A New way to receive Trojan Thursday is here. Please help spread the word about Trojan Thursday. If you would like to receive Trojan Thursday each week please go to https://unitrojanthursday.wordpress.com. You will have to scroll all the way down to the bottom of the page and type in your email address. Once you are signed up you will receive an email each week with the latest Trojan Thursday. Last week our boys swim team won the CIF Championship and this week the awards kept coming in. The OC Register announced their All County team and it was packed with UNI swimmers. Congratulations to the following All County selections. 200 Medley relay are Daniel Tran, Judd Howard, Andrew Knoell, and Will Hofstadter. Below is an article from the OC varsity on the all-county team. Congratulations to Konrad Kozlowski for making it to the round of 16 in the CIF individual tournament. Konrad will play in the round of 16 today. Konrad won the PCL individual championship a few weeks ago and his hot play has carried over to this CIF tournament. Good Luck today Konrad. The athletic department would like to congratulate Mike Gerakos for receiving the CIF Champions for Character award. We received word from the CIF office yesterday about this award. This could not go to a more deserving person. Mr. Gerakos is our activities director and has coached Baseball for years here at UNI. Coach Gerakos was given the award for exemplifying the very finest in sportsmanship, character, integrity and athletics. Coach Gerakos selection was made from thousands of possible recipients in the CIF southern section, so this is truly a great honor. We in the athletic department could not think of a more deserving person. Congratulations Coach G and thanks for everything you do for this school. 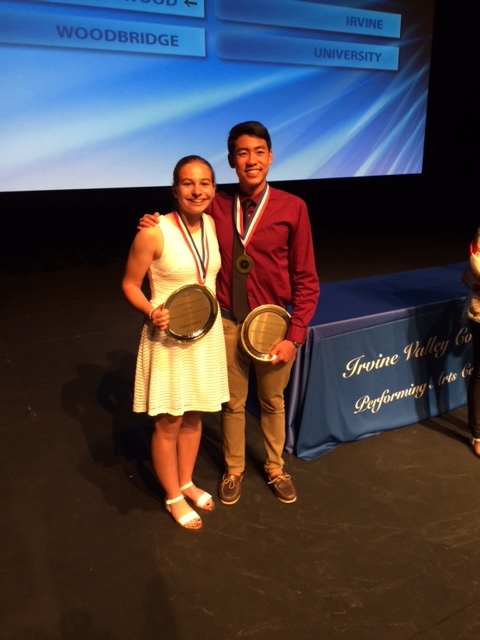 On Monday night the exchange club of Irvine held the scholar athlete of the year ceremony at IVC. 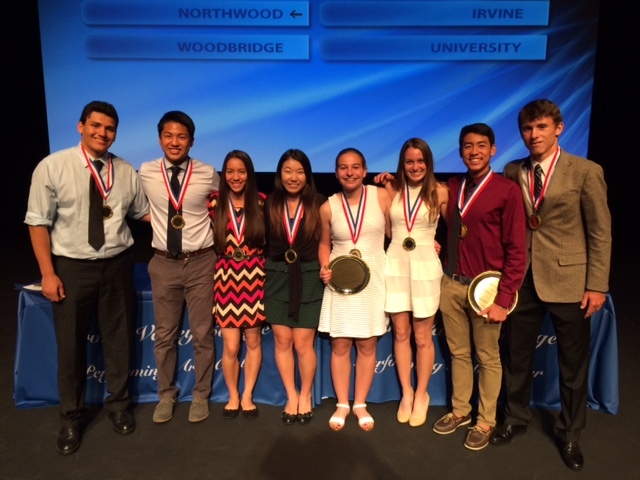 Each city of Irvine school selected 4 male and 4 female athletes as finalist for the scholar athlete of the year. We would like to recognize and thank our finalist for exceling in both the classroom and in their sport. Below is the list of our athletes who were recognized. We would also like to congratulate our winners for the scholar athletes of the year. Sarah Stern and Daniel Tran were selected by the UNI head coaches as our male and female scholar athletes of the year. Congratulations to all 8 of these amazing scholar athletes. Below are a few pictures from the event. 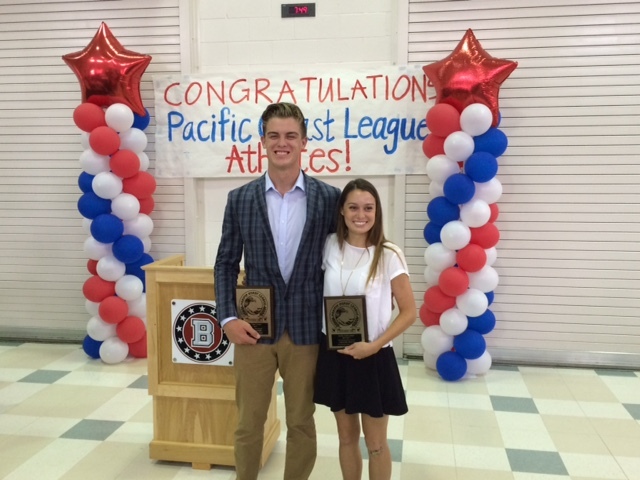 On Monday night the Pacific Coast League held their annual sportsmanship award breakfast. We would like to congratulate Parker Dickey and Caroline Werth for receiving this award. Both Parker and Caroline are what is right about high school athletics. They are leaders both on and off the field. Congratulations on this great honor Parker and Caroline. Below is a picture of the two at the breakfast. Last night we completely filled Mendocino Farms for their soft opening. We received over $1300 in donations to the Athletic Training Room. Thank you for showing your support of Brittany and our athletic department. We would also like to give a big Thank You to Mendocino Farms for letting us come to this event. Everyone enjoyed their food and the atmosphere of the new place. If you and your family are in need of a place to eat lunch or dinner in the future please keep Mendocino Farms in mind. The more we can support restaurants that support our athletic programs the better. You won’t be disappointed with the food there. It is amazing! 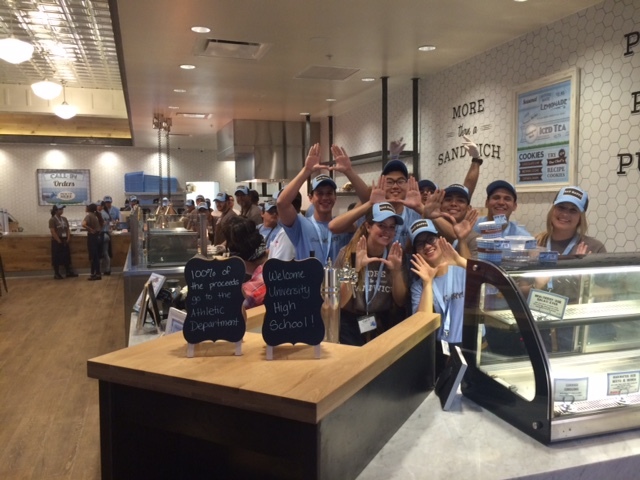 Below is a picture from last night of the several Mendocino Farms employees who are current or former UNI students. If you did not get a chance to attend last night you can still make a donation. We are asking for $10 per athlete to go towards the athletic training fund. Mr. McCaffrey will be visiting each sport during 6th period today and Friday. Show your support of Brittany and make a donation this week. Help publicize our athletes – Follow us on Twitter @UNI_Athletics – Using social media helps us highlight our athletes. To get the latest on UNI athletics please follow us. We will have updates from big games and from the GOWs (Game of the Weeks). Wear UNI clothing or colors to the games. Send us your picts wearing your Trojan Army shirt.